Posted July 7, 2014 by Richard Condon & filed under Blog. Landscapers need to wear safety vests to be seen on the job. They often work nearby oncoming traffic moving at speeds of 25 mph or higher. When their attention is diverted away from approaching traffic, wearing a Class 2 reflective safety vest would be the ideal choice for visibility. Safety Depot Class 2 safety vests come in mesh, solid, or a combination of both materials. Mesh works well to keep landscapers from overheating while working in the blazing sun. Solids are a nice choice for when the weather is a bit cool or the ground is mucky, protecting undergarments from debris. Each Class 2 safety vest provides 360-degree visibility, featuring reflective bands and fluorescent base material (lime-green or orange). Safety Depot Class 2 safety vests have either Velcro, zipper or snap closures. All of our vests offer some type of handy pocket – open chest pockets for tools like pruners, sheers, etc., as well as side slash pockets, closure pockets, or a combination. Color selection should depend on the background of the work being performed. For instance, if you’re working in complex green and yellow foliage, you should wear a fluorescent orange safety vest to remain visible. If you’re out in the open, a fluorescent lime safety vest might be the way to go. Safety Depot sells over 25 Class 2 reflective safety vests. For more options, check out our complete line. We offer several adjustable vests as well as two vests with reflective X-back stripes. Even if you don’t work roadside and aren’t required to wear a Class 2 vest (or higher), we also have a variety of economy safety vests for worker identification and visibility. 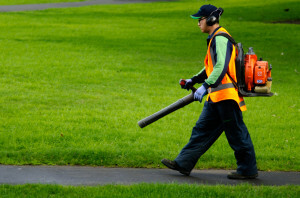 Landscapers are often using dangerous equipment or landscaping chemicals such as lawn mowers, chain saws, hedge trimmers, weed wackers, fertilizers, weed killers, and more. Safety Depot has a wide selection of tinted safety eyewear to help protect workers from flying debris.